Washington junior Rayana Burns (1) brings the ball up court during a non-conference game at Minford High School Saturday, Jan. 26, 2019. 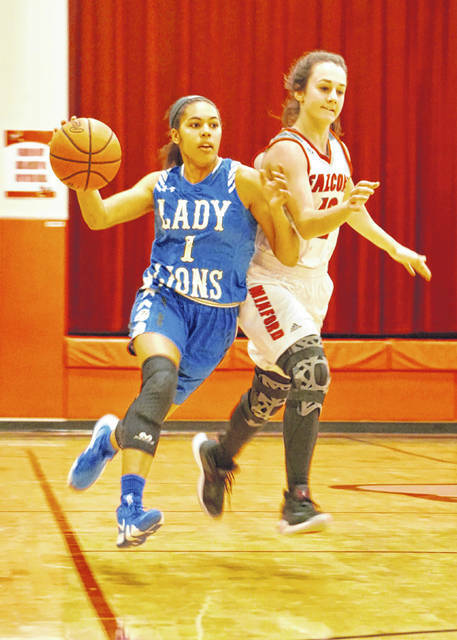 JACKSON — The Washington Lady Blue Lions traveled to Jackson for a Frontier Athletic Conference match-up with the Ironladies. Washington clinched at least a share of the Frontier Athletic Conference crown, with a 76-19 rout of Jackson. Washington is now 8-0 in the conference with two games remaining. One game, at home against McClain, was scheduled to be played Wednesday, Jan. 30, but was postponed due to bitterly cold temperatures. Miami Trace defeated McClain Monday, 57-39. The Lady Tigers and Lady Panthers are tied for second place, both with two losses in the conference. Washington had four players reach double figures against Jackson, led by junior Shawna Conger with 16 points. Senior Hannah Haithcock and junior Rayana Burns both scored 13 points and senior Bre Taylor scored 11 points. Haithcock had eight rebounds, three assists, five steals and blocked two shots. Burns had seven rebounds, seven assists, two steals and one blocked shot. Taylor had three rebounds and seven steals; Conger had four rebounds, one assist and two steals. Senior Kassidy Hines scored seven, senior Maddy Jenkins had six points. Freshman Haven McGraw scored four points, freshman Mia Moats had three points, junior Abby Tackage scored two points and freshman Aaralyne Estep had one point. Washington scored more points in the first quarter (21) than Jackson did in the entire game. The Lady Lions led 41-10 at halftime. On Saturday, Jan. 26, Washington traveled to Minford for a game against the Falcons. Washington won that non-conference game, 51-44. Please see a future edition of the Record-Herald for a report on that game. Washington (now 14-4 overall) will be at home Saturday to take on Grove City with the j-v game starting at noon.